I have a breakdown of the events that I did each day below, but here are some general observations during the trip. The pollution in the tubes really started to bother me towards the end of the trip. The escalators move twice as fast as the ones in the US. The population seemed to be thinner then the general US population. The parks get a lot of use, in the otherwise crowded city. The work hours seem to be later in the morning, a 9:00 to 6:00 work schedule seems to be the norm. There seemed to be a scheduled of coffee and pastry in the morning before work and a beer and socializing after work. I did a lot of walking in London and walking was a good way to get across the city if you did not want to ride the tube for everything, walking was easy coming from a mile high city to a sea level city. My basic day involved getting up, have breakfast at the hotel, taking a walk in the morning until the tube price dropped and then seeing a couple major tourist attractions. On a number of days I managed email home for free at libraries. Every night I would spend time writing down in a journal what I saw that day, as well as going over my itinerary for the next day, read through some guide book about what I would see, and watching some British News on TV. Tuesday 6:30AM -Arrive at Work. 9:30AM -Discover that Mike can not go because of a passport issue. 12:00PM -Decide to go by myself, driven to the airport by Val. 2:30:PM -Original (1:45PM) flight through Chicago, O'Hare was Delayed because of weather. -New flight through Washington, Dulles. Wednesday 9:35AM -Land at London Heathrow. 11:30AM -Arrive at the hotel via the tube. Then Library -email, Hyde Park, Harrods. Thursday 7:30AM -Morning walk through Hyde Park, Marble Arch, Bond Street. 10:30AM -Tower of London, walk past St. Paul's, Ye old Chester Cheese bar. 6:00PM -Oxford circus walk through SOHO with Max, Pizza Express, O'Neil's music room. Friday 9:00AM -Tube to St. James, St James park, Buckingham Palace -changing of the guard, Westminster Abbey, Parliament and Big Ben. 12:00PM -Fish and Chips, Trafalgar Square, National Gallery. 6:00PM -Supper in Richmond with Max. 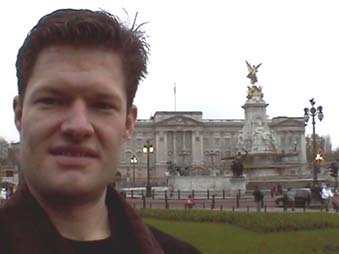 Saturday 8:00AM -Tube to Holborn, walk to Russell Square meet Max and Nicola. 10:30AM -British Museum, All One Bar Lunch, Black Market Records, Costa Coffee. Monday 8:00AM -Walk through Hyde Park to Notting Hill Gate Tube Stop, walk Portobello Market. 9:00AM -Tube to Kings Cross, British Library, Forbidden Plant store, shopping. 12:00PM -Tube to Blackfriars, Millenium Bridge to Tate Modern Museum, Mulligans Restaurant. Tuesday 6:00AM -Tube to Heathrow Airport, Flight back through Chicago, O'Hare. 4:30PM -Back in Denver, picked up by sister.